Devotees burning joss sticks during their worship. Note the sugar canes that decorate the temple. Penghulu Soon distributing food offerings to the worshippers as a blessing to them. 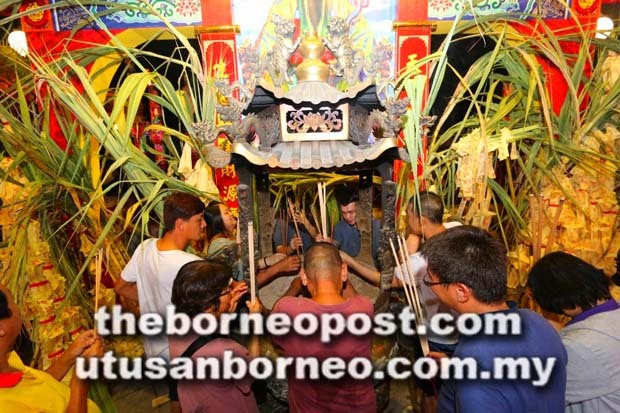 SIBU: The Chinese celebrate the birthday of the Jade Emperor on the ninth day of the Lunar year which fell on Tuesday. In the Chinese traditional belief the Jade Emperor is the most senior among the gods and is especially revered among the Hokkien communities in Fujian province, Taiwan and South East Asia who worship him as Ti Kong the heavenly elder. The Chinese community here celebrated this auspicious day with a big fair at the Tua Pek Kong temple on Tuesday night. Thousands of worshippers thronged the temple to take part in the celebration and sought blessings from the Jade Emperor for the coming year. 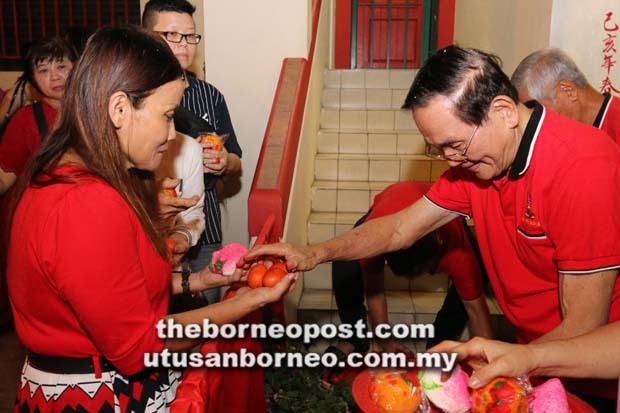 A devotee told The Borneo Post the birthday of Jade Emperor was often referred to as the Hokkien New Year. A curious aspect of the Jade Emperor birthday celebration among the Hokkien is the use of sugar cane as the main offering of their worship. This practice according to oral history started in the Ming Dynasty when the Hokkien community who lived along the southern coast of China were often attacked by Japanese pirates. During a major attack by the pirates on the coastal communities while they were celebrating the birthday of the Jade Emperor they were caught by surprise and fled their homes to hide in a sugar cane plantation. Apparently the pirates could not find them and they were saved. Out of thankfulness to sugar canes and their attribution to the protection of the Jade Emperor for their narrow escape, sugar canes became the major item in the Hokkiens’ offerings in their worship. Other communities who celebrate the birthday later adopted this tradition of offering sugar canes as part of their worship. “Celebrating the birthday of Jade Emperor is not exclusively for the Hokkien today. It is a celebration for all believers from the different dialectic clans,” he said. To mark the grand celebration, Tua Pek Kong Temple here was festooned with sugar canes. At Tua Pek Kong Temple two altars were set up outside the temple – one for Jade Emperor, and the other consisting of two long tables for the food offering. At the stroke of midnight, the temple committee led by its chairman Penghulu Soon Choon Hoo started their prayers and rituals.